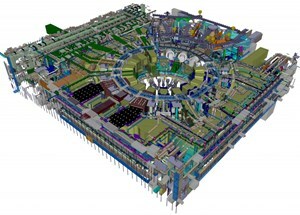 Isometric view of the ITER plant systems in Level B2, B2M, B1 and L1 of the Tokamak Complex. In May, ITER Newsline reported about the creation of a Building Integration Task Force whose mission it was "to make sure that all the systems to be installed in the Tokamak Building, and in the adjacent Diagnostic and Tritium Buildings, are correctly defined in the overall master plan." Simply speaking, the Task Force has to make sure that all the walls, ceilings and penetrations are in the right position and that the proper provisions have been made for all cable trays, pipes, ducts, and embedded plates (necessary for the reinforcement of the concrete structure). It was thus with great relief this week that the Building Integration Task Force handed over a new batch of documents to the European Domestic Agency (F4E) and the Architect-Engineer ENGAGE. The documents include all the data for level one (L1) and basement level one (B1) of the Tokamak Complex. The data for levels B2 and B2 M had been transferred in September. "An intense and challenging period of several months is now behind us," commented Jean Jacques Cordier, leader of the Design Integration Section with responsibility for the delivery of the building configuration documents. "During this period we revised systems configuration, to take into account progress in the maturity in the layout of the systems, compliance with safety, project changes, and design refinements." "This work was strongly supported by all engineering directorates," added Ingo Kuehn, responsible officer for Tokamak Complex building integration. "Configuration Management Models were developed by the ITER Design Office and the ENGAGE consortium relating to civil works and building systems services." A Reaction Force Task Force established by F4E and ENGAGE will now verify all the forces and loads specified in the documents in preparation for the first concrete pouring for the lower floors in spring 2012.